As some may know I’m a student of Natural Sciences at the University of Modena, Italy. I’m no anthropologist, since my main interest is birds and mammal ethology, but I’ve reached some personal ideas on Homo sapiens as well. Firstly, I see H. sapiens as just another species in the nature kingdom and not something apart from it. As all species it has its own special features that distinguish it from the others and determine it for what it is. There has been various thesis about what feature makes H. sapiens special ”, the most famous being the opposable thumb, the use of tools or the use of a language. Nevertheless we can find those features in many other species. Just to give an idea, the opposable thumb is present on many species of apes, not only the anthropomorphic ones, on the giant panda , on the falangerids marsupials, on the koala, on the opossum, on some South American tree frogs and on the chameleons. 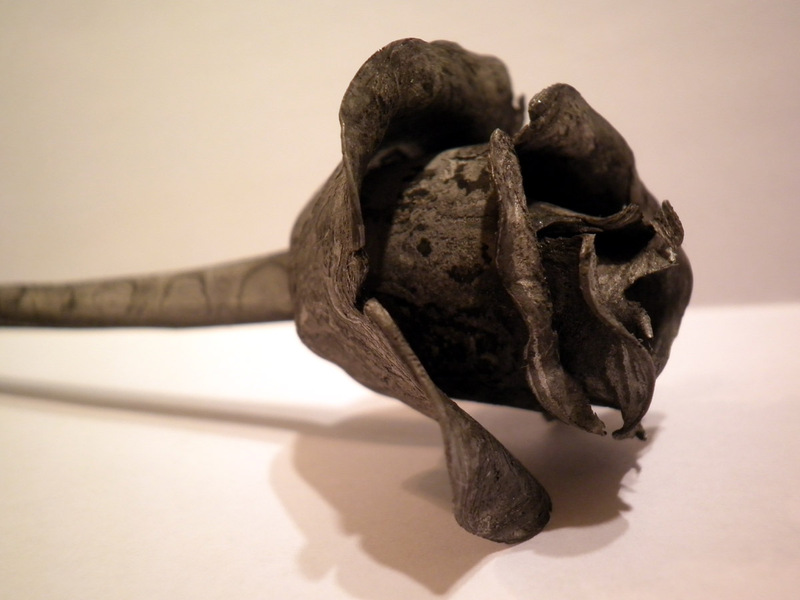 The use of tools is present not only among apes, but, for example, also in few species of finches, most notably Camarhynchus pallidus; known for using cactus thorns when searching for food in very tight spaces. The use of a language to communicate, not only to just express possession of a territory etc., is present, at least for what we can understand now, in mammals and birds and it’s clearly obvious if we just take our time and actually listen to them talking to each other. 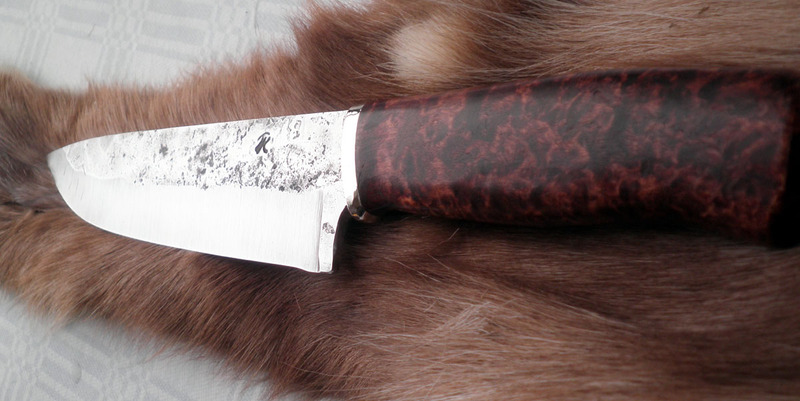 A kitchen knife is a tool, a special tool, which main purpose is cutting and slicing. They’re nothing like everyday outdoor use knives. 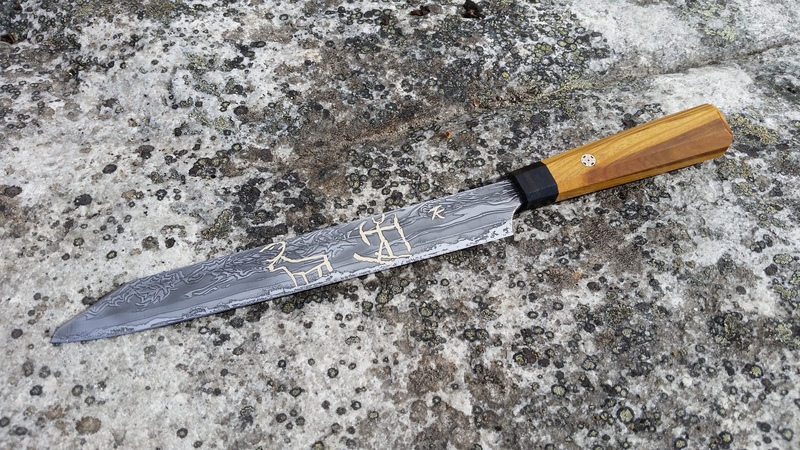 There is a whole lot of different purposes and related models of course, but I think the most useful style is the sharp allround blade used for cutting and slicing vegetables, meat, etc. 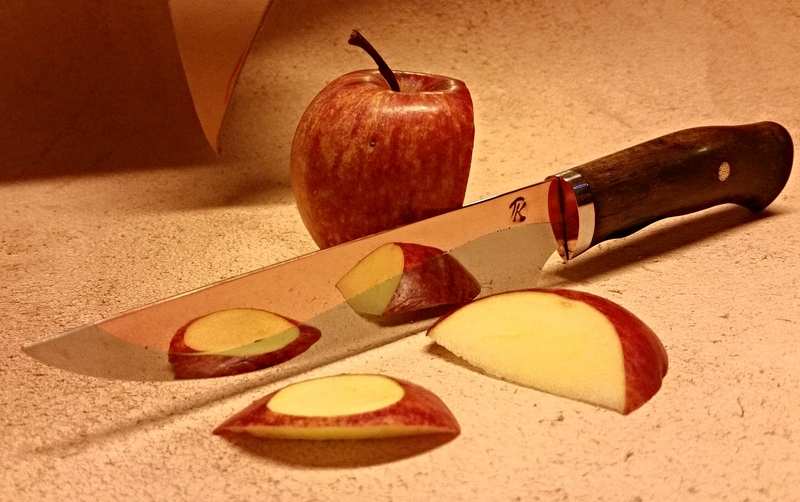 It needs to be thin and very sharp, but durable, like all blades of course, but a kitchen knife is, as said, primarily a special tool for fine cutting task. 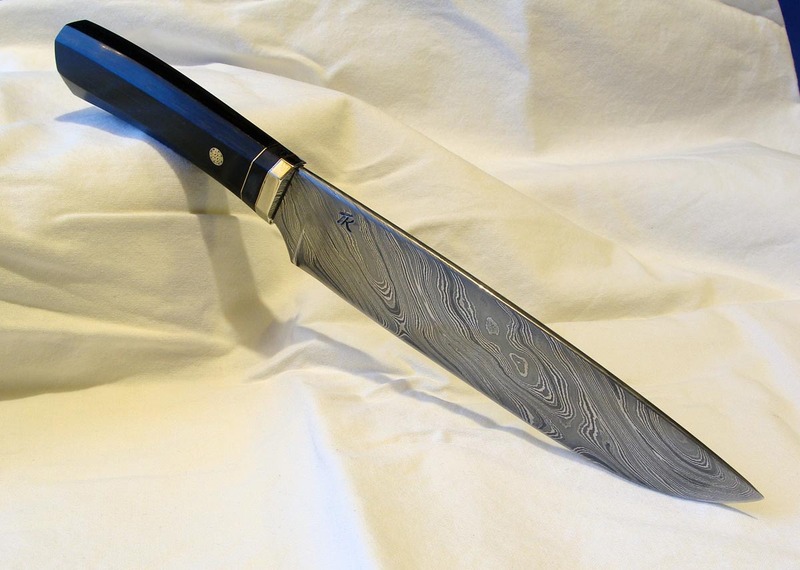 In my opinion damascus steel fits kitchen knives very well: they get better care than allround knives and can also become nice quality, decorative products in the kitchen. The modern powder metallurgy created steels like RWL-34, which are very good choices due to their corrosion resistance and edge holding abilities. 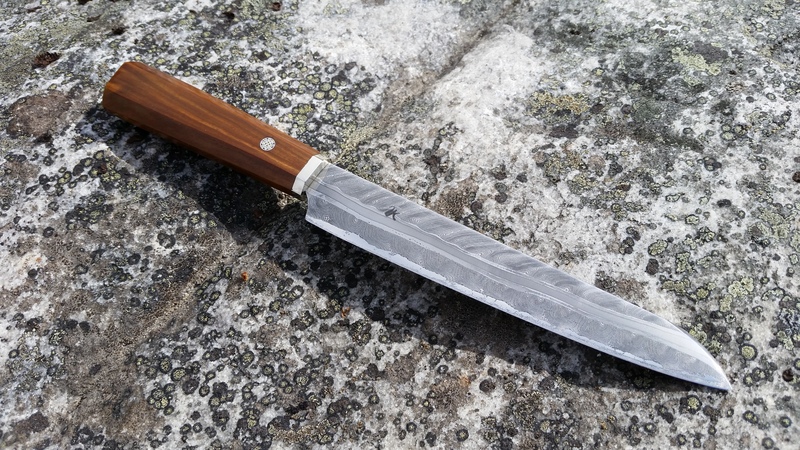 Proper steel choice and heat treatment are vital since the blade has to sport a thin edge and equally needs to be, at 62 or more HRC, tough and durable. 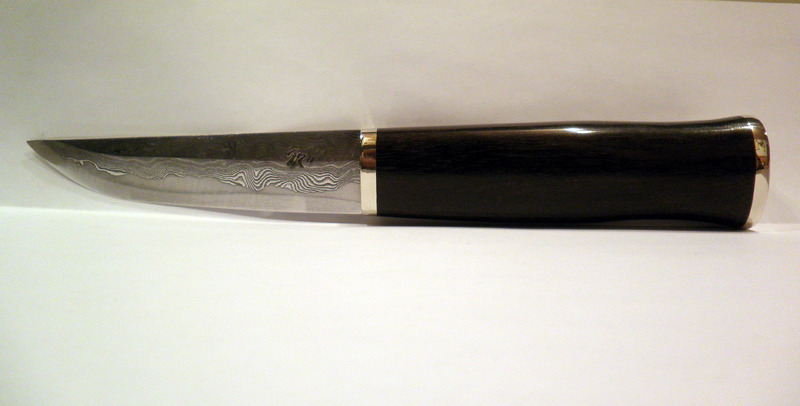 Stainless damascus kitchen knives are little practical luxuries, even if prices are higher you get the full worth of your money. 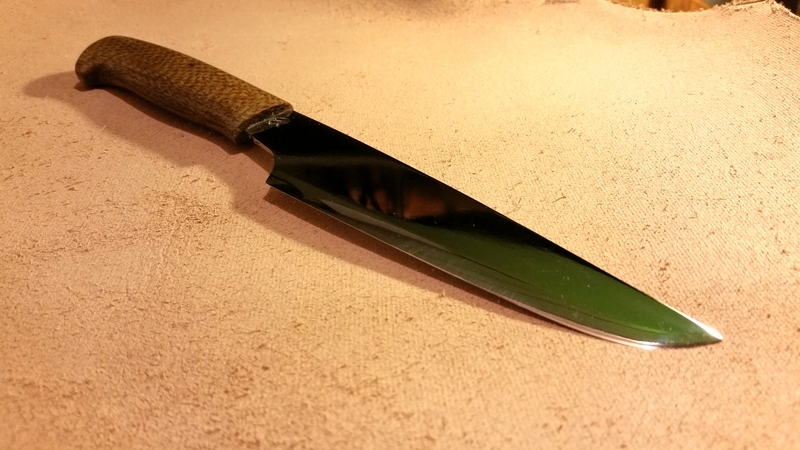 My personal preference goes to laminated blades with iron sides wrapping a fine quality carbon steel core: I appreciate Japanese blade culture and achievements. 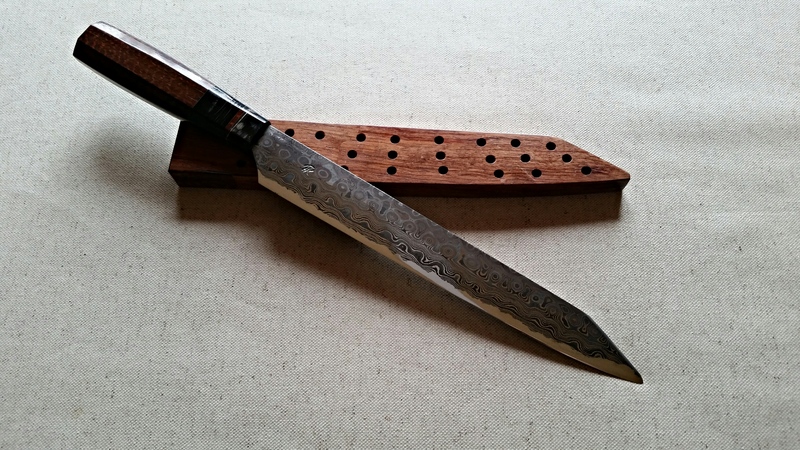 Traditional carbon steel and nickel steel (15N20) damascus also work very well, but needs a little extra care, like oil sometimes and drying after every use, but everybody cleans and dries their knives after cooking anyway. 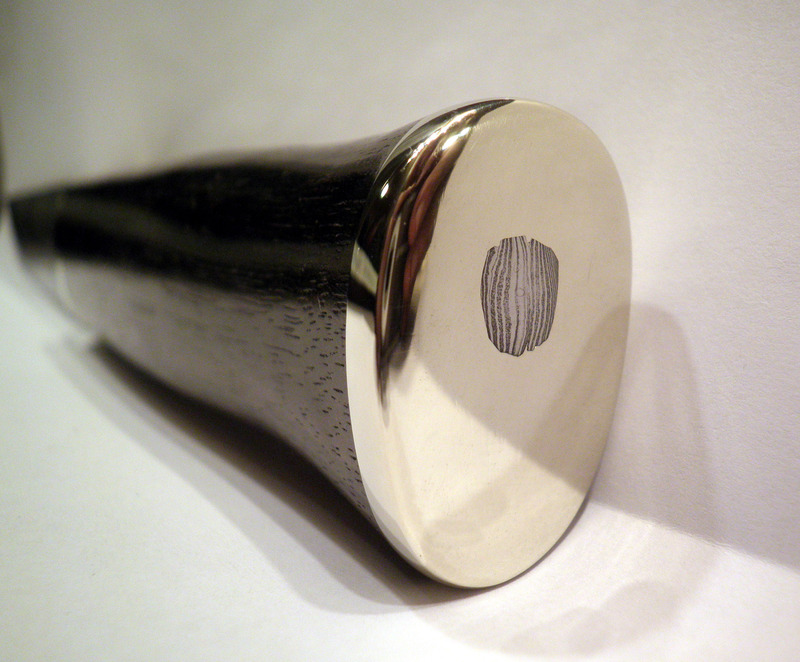 To ensure a long life the tool handle materials also need to be carefully chosen. A well prepared and treated natural wood is good, but modern stabilised woods are the best choice, especially if matching a stainless blade. The blade shape comes from the knifes final use, obviously one blade can’t rule them all: a blade good with vegetables and salads isn’t necessary the best with meat, boning or fish filleting. 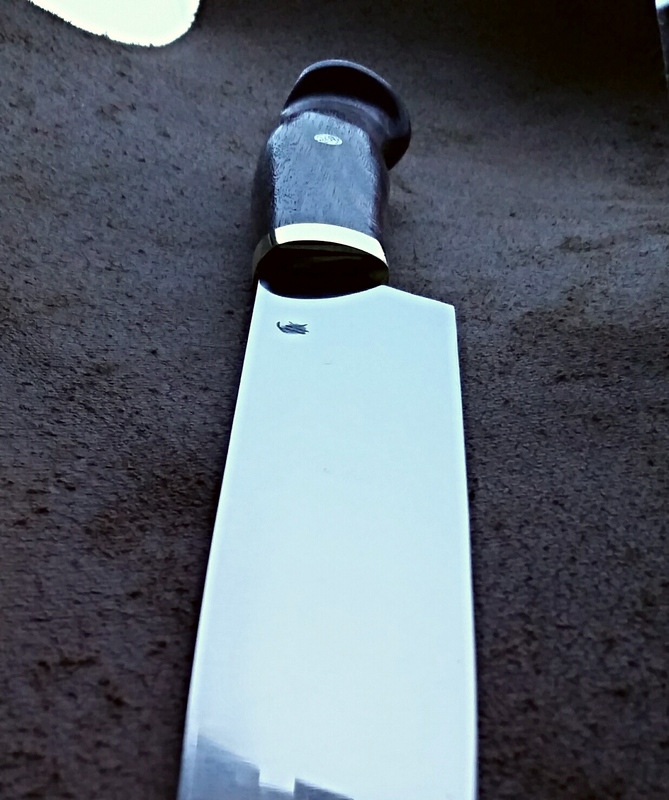 In the end, a chef knife, is the chef’s personal and special tool. 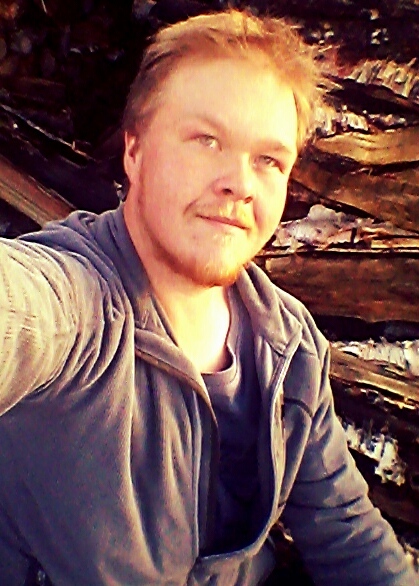 Tero Kotavuopio is a smith from Karesuvanto in the far north of Finland. Karesuvanto is on the Muonio River in Lapland near the border with Sweden. I really appreciate Tero’s philosophy and share in his lament that people are for the most part no longer self sufficient and don’t have the skills that past generations had. 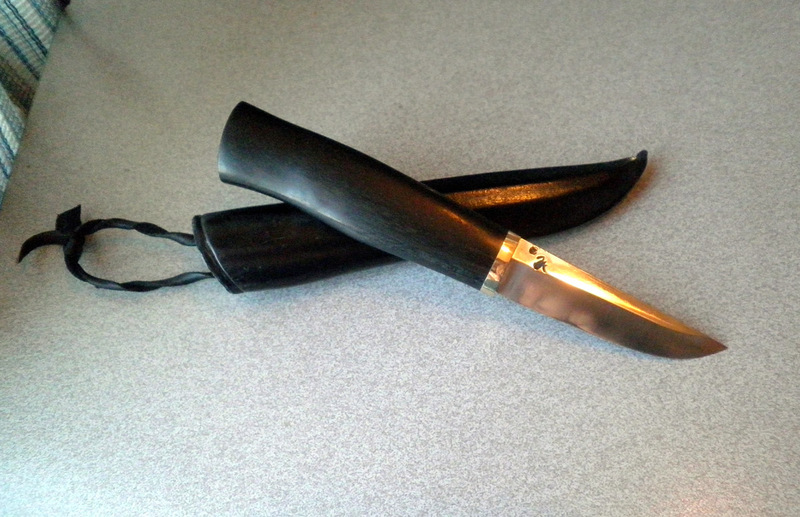 For Tero the knife is very important and must be able to perform a task without fail. 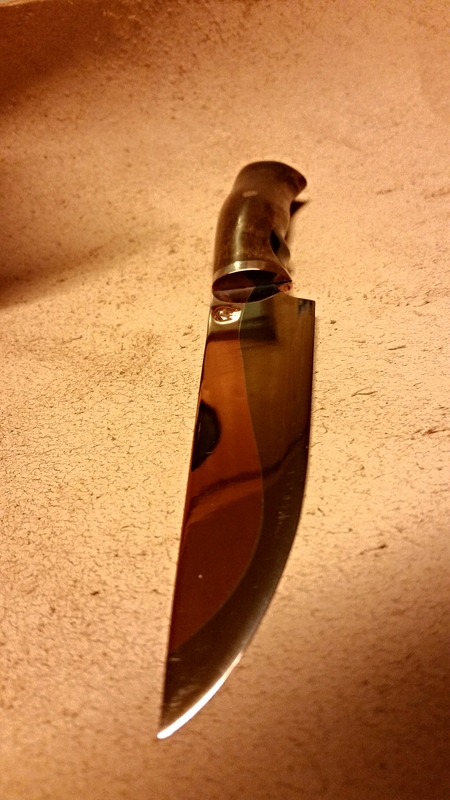 “Knives priority is to be perfectly functioning tools. 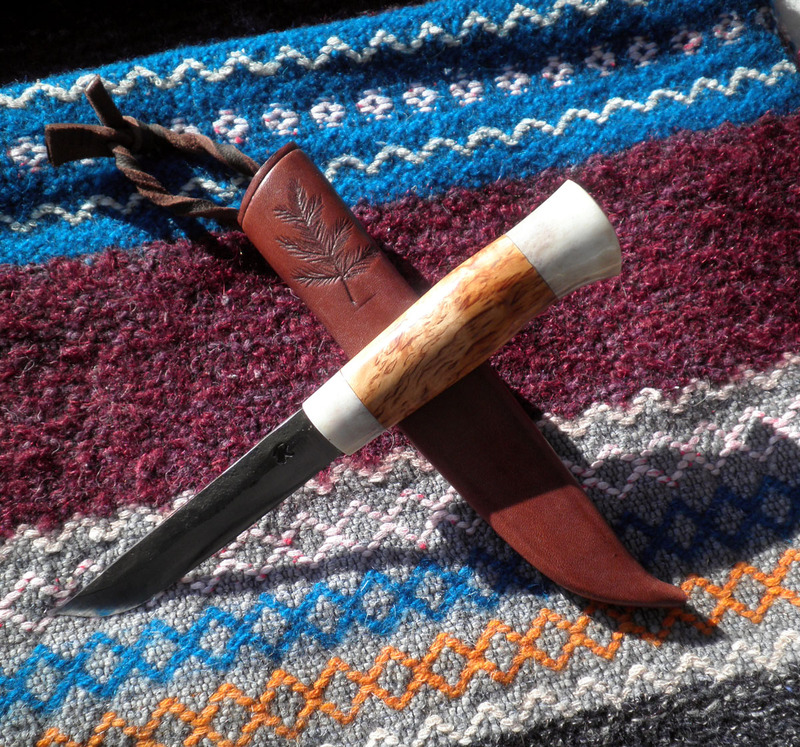 This overcomes everything else.” Tero’s puukkos are working tools but rise above that purpose to carry on the traditional design and artistry of the Finnish puukko.Tero creates some very fine knives and I think you will enjoy seeing his work. Thank you Tero! “The most important thing is to make good tools. In our family there have been blacksmiths in the past, but the last of them was active as a village smith in the early 1900´s. I’ve been kind of making everything and I’ve always been into learning old skills. 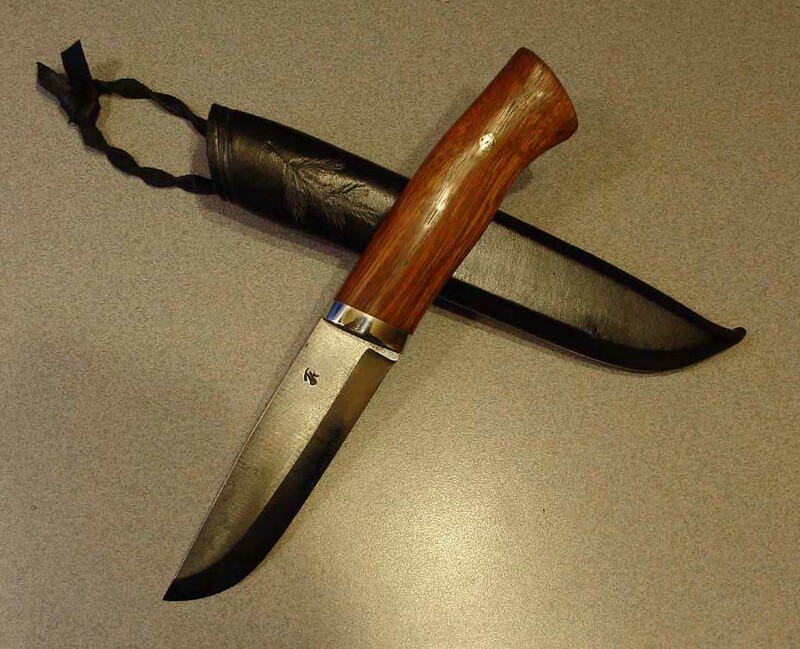 Because I live “off the land”, by fishing and hunting, knives are very important part of my daily way of life. 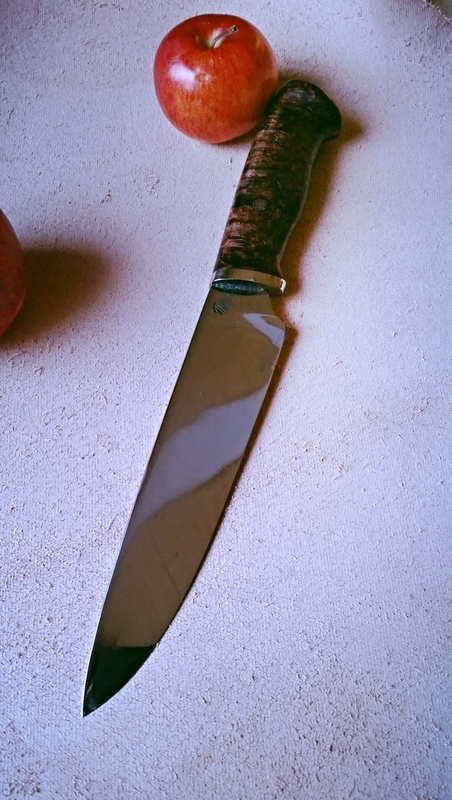 Good factory made knives were pretty hard to find, while the old hand forged ones were still good users, so I decided to try to make knives by myself and after a long time of trying and testing, I think I am now making well servicing tools. I can’t actually tell any specific time or date about my first experiences as a smith, because I’ve been heating and twisting nails and stuff since I was a young kid. 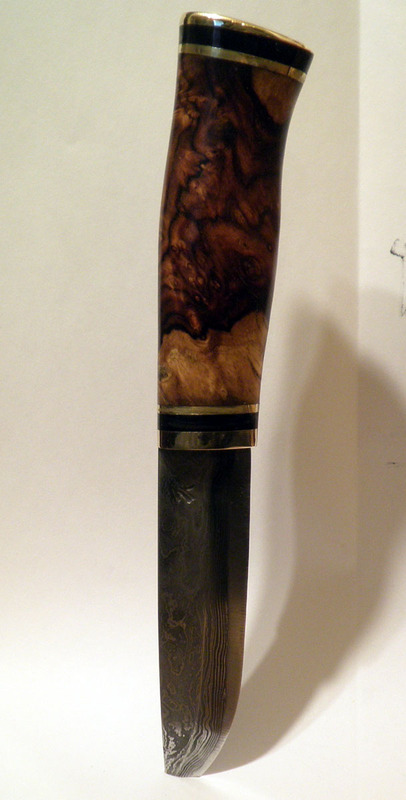 I even did several knives before I got to think that I could possibly make some bread for my table out of knife making. I’m totally self taught. Naturally studying the process took a long time and I’ve got a lot of hints, tips and help from older smiths as well as from others who are into the same stuff. I’ve also read a lot of metallurgy literature, but it’s not as valuable as my own field experience and testing on actual materials when you’re trying to achieve best durability and edge retention. 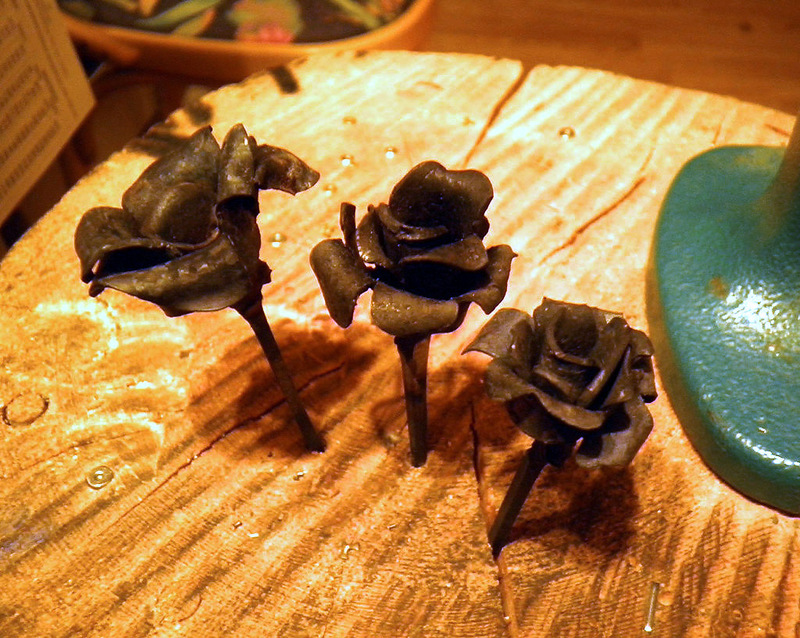 Molding, handling and tempering steel, even if it sometimes might seem like, isn’t still witchcraft nor mystical. It’s just raw facts, data, knowledge as well as being able to repeat the process correctly in the same way, time after time. Up here in the north there has never been many smiths. 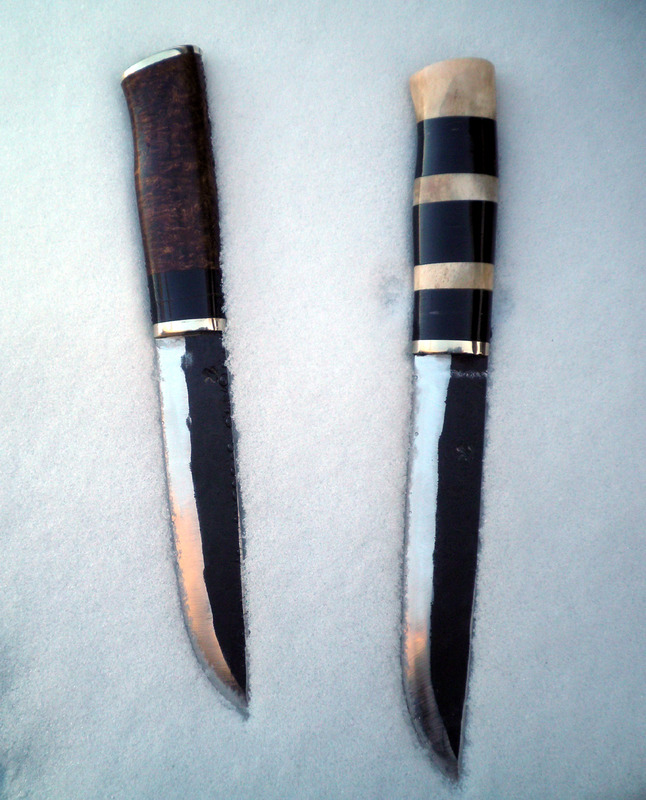 The Sami reindeer herders don’t have almost any blacksmith tradition: they used to trade a lot, usually to get forged tools including knives, from Norway and Sweden. My main and only source of inspiration is the usefulness. Knives priority is to be perfectly functioning tools. This overcomes everything else. 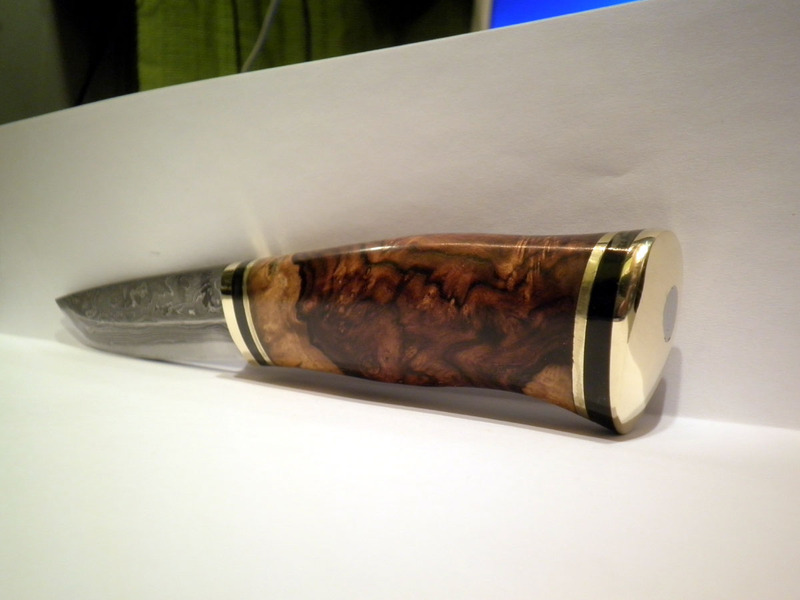 The shape comes from my own mind and I don’t give any value to jewelry-like display and showcase knives. 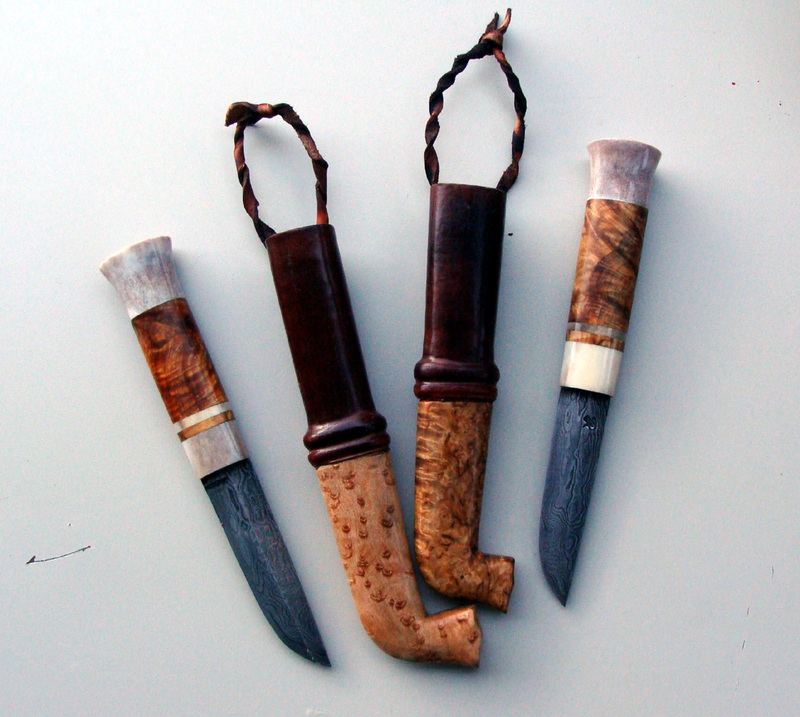 I think nobody should sell those as puukkos or knives, they should be sold as decorations. 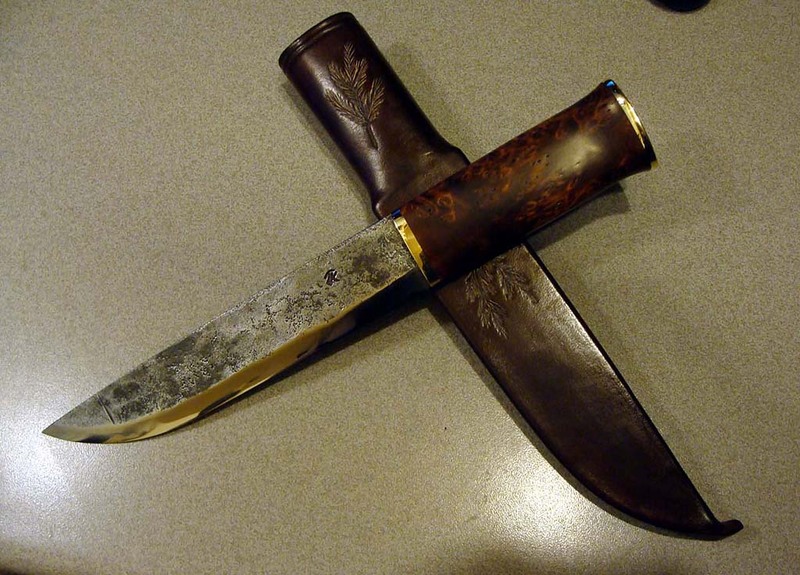 The current trend seems to be imitation and copying of previously made knives. 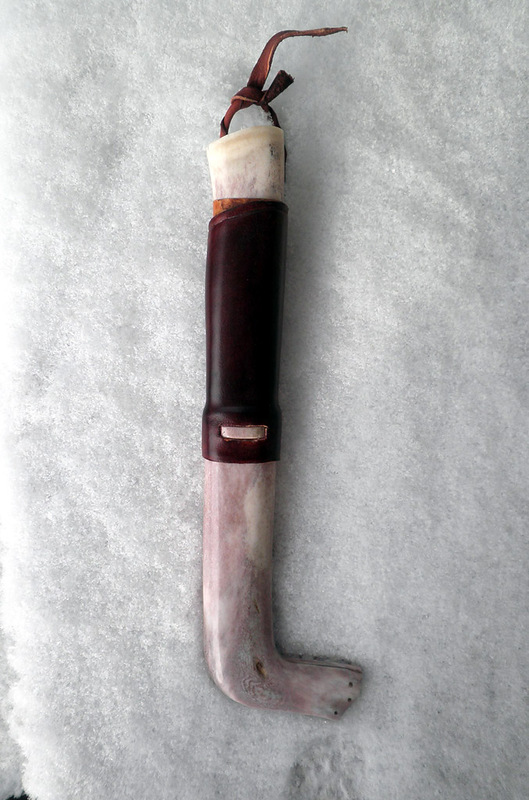 Trying to achieve ice cold, perfectly executed knives is simply stupid, as valuable as a piece of plastic. Making only some certain knife model lacks the use of creativity and I would get bored immediately. 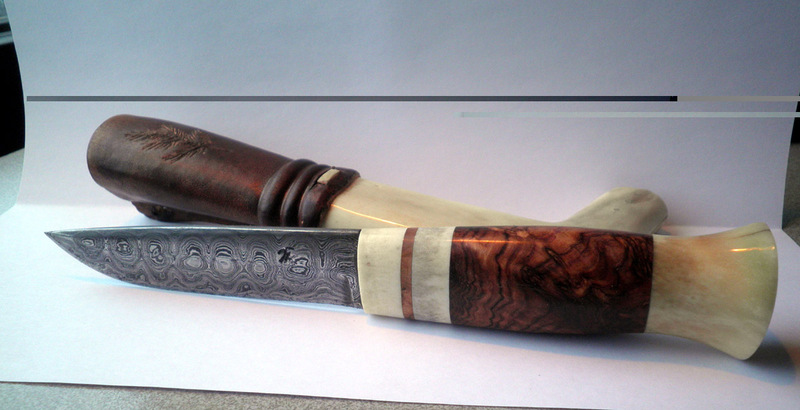 It’s also impossible to make only one model, as for different tasks there are different knives. 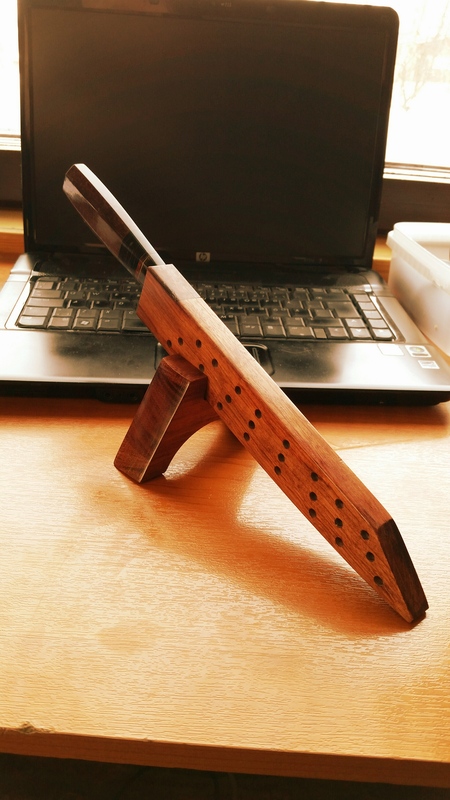 I am also interested in many other handcrafts and I like to try everything including the most likely impossible attempts. I don’t consider making something in particular as a categorized craft, as I see it as general handcrafts. It wasn’t a long time ago when almost everybody had skills to do a lot of things and it wasn’t something that a man would have bragged about. It’s very sad to see how today’s people are mostly lacking skills or just specialized in a narrow range of crafts, if any. As I said, I try to make as good tools as possible. Good edge retention is my main goal so far, and it’s not easy at all: it demands very accurate forging as well as heat treating. Good self criticism and quality control are important. Making bad tools is making mockery out of the work of the users. Craftsmanship skills are the most important things a person can have. After all, what you know and what you can do are the only things you have. Everything you can make will wear out, but not your knowledge and skills.